Minister for Health, Simon Harris T.D. officially opened the new offices and lab facility of environmental consultants Verde today in Kilcoole, Co. Wicklow. Verde employ a total of 50 staff in four offices in Ireland. The new head office in Kilcoole features state of the art lab facilities for soil and water quality testing. Since Verde was established in 2002 the company has grown from a staff of five to a total of 50 and a turnover of €350,000 to almost €6 million. Paul Van den Bergh, founder of Verde “We are very proud of our beautiful new facilities here in Kicoole and delighted to welcome Minister Simon Harris here today to perform the official opening. Our company has grown and developed into one of the leading environmental consultancies and service providers in the country and these new premises give us scope for the further growth planned in the coming years”. Verde provides vital oil spill response, assessment and remediation services in the areas of soil and water pollution along with expert advisory, monitoring and assessment services for noise pollution, waste management, energy consultancy and ecology. They have four facilities in Ireland – Kilcoole, Cork, Galway and Mayo – as well as an office in Nigeria. “Our environmental scientists, remediation experts and consultants in the new Kilcoole facility offer everything from contaminated land and water assessment and remediation, hydrogeology and ground water resource development to due diligence exercises, noise and air monitoring services, ecological services and a range of IPPC license advice and monitoring” added Paul. Clients of Verde include Janssen Pharmaceuticals, Irish Distillers, Glaxo Smithkline, P&G, Glenpatrick, A&L Goodbody, PWC AXA and Zurich. Why you need to carry out environmental due diligence before you buy a property. This year instead of sending out Christmas cards, we have sponsored a Star on the Focus Ireland Christmas Tree. The Sponsor a Star campaign has been running for 16 years and helps change the lives of families, children, young people and adults, who so desperately are in need of help in the run up to Christmas and into the New Year. Focus Ireland announced today that it has supported over 14,000 people so far this year who are homeless or at risk of losing their home. This is already 500 more people than the charity helped in the whole of last year. Founded in 1985, Focus Ireland works with people who are homeless or are at risk of losing their homes across Ireland. They offer individuals and families, advice, support, education and housing to help people to have and keep a home. Focus Ireland believes that everyone has a right to a place they can call home and continuously campaign to address the causes of homelessness. On behalf of those who are homeless or at risk of losing their homes, I would like to thank you and all the staff of Verde Environmental Group for your support of our annual Focus Ireland Sponsor a Star Campaign. Your very generous donation will help us to change the lives of families, children, young people and adults, who so desperately need our help in the run up to Christmas and into the New Year. Demand on our services has never been so great. So far this year – more than 1200 children and their families have become homeless. Focus Ireland are there giving hope and support to those in crisis. Thank you on behalf of all the staff in Focus Ireland for supporting our work and enabling us to reach out to those in crisis by contributing to our Christmas tree at the top of Grafton Street.We depend upon this campaign to ensure that we can continue to provide hot food, comfort, advice and support to those who need it most this coming year.We truly could do little without the support of companies like Verde Environmental Group, who share our belief that homelessness is a problem that can be solved – together. From all of us at Focus Ireland, we wish you and the staff of Verde Environmental Group a very happy and peaceful Christmas. Thank you. When it comes to investing in property developments or acquisitions, environmental due diligence can save your client an unpleasant shock and much expense. Irish company Verde Environmental Group today launched new offices at Airport East Business & Technology Park, Cork. 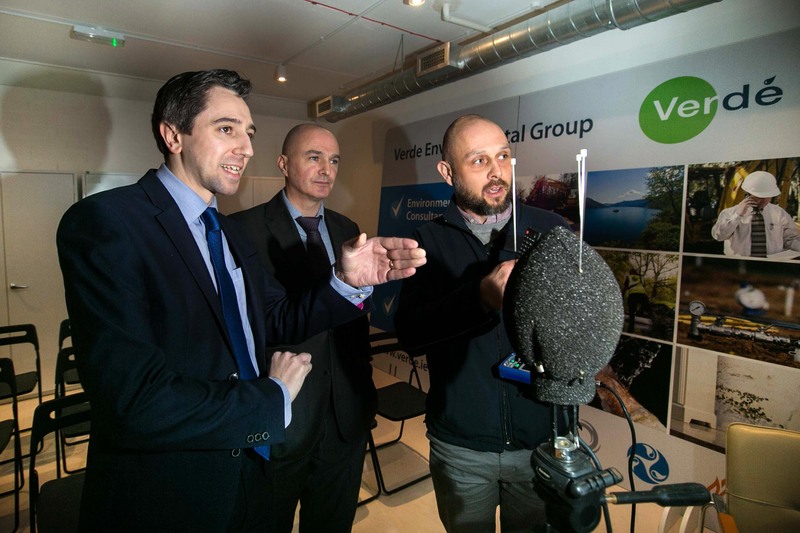 Verde’s expansion in Cork brings their employment to a total of 50 staff across three offices in Ireland – Cork, Galway, Mayo and Wicklow – and a recently opened international office in Nigeria. 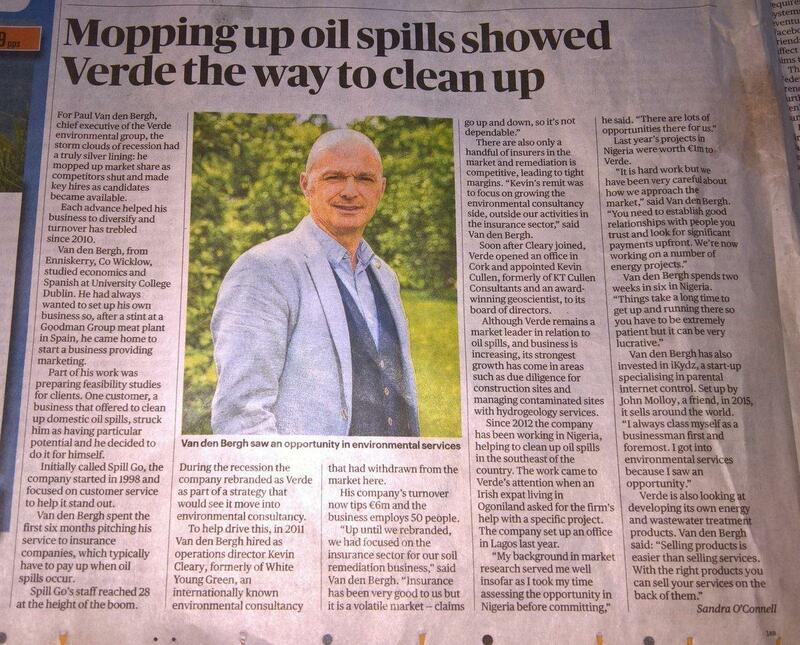 Verde is a full service environmental consultancy set up fifteen years ago by Wicklow man Paul Van den Bergh. “We are delighted to open these new offices in Cork. We had a smaller presence here since 2010 but business has grown by 30% over the past three years so we required larger premises. We have expanded our services significantly in Cork in recent years and we look forward to increasing this growth further into the Munster region” says Paul Van den Bergh. Initially specialising in oil remediation, Verde has developed into a full service environmental company providing vital expert advisory, monitoring and assessment services in the areas of soil, water and noise pollution as well as waste management, energy consultancy and ecology. “Our environmental consultants in Cork offer everything from hydrogeology and ground water resource development to due diligence exercises, noise and air monitoring services, ecological services and a range of IPPC license advice and monitoring” added Paul. Clients of Verde include Janssen Pharmaceuticals, Irish Distillers, Glaxo Smithkline, P&G, Glenpatrick and A&L Goodbody. Dr Gary Canny, PhD, BSc Env, Technical Manager of Verde Environmental Group will present on The Management and Remediation of Oil Spills at the one day buildeng 2017 Conference, taking place on Friday 29th September at City North Hotel & Conference Centre, Gormanstown, Co. Meath. Verde is delighted to announce that it will be the main sponsor for the 16th King of Greystones Triathlon taking place on Sunday 30th July in Greystones, Co. Wicklow, with all proceeds going to The Gavin Glynn Foundation. The King of Greystones Triathlon has grown hugely since its inception and has raised over €500,000 for local charities. Verde are delighted to support such a great, fun event that supports the local area where we are headquartered. Verde’s Warehouse Supervisor Minde Maziliauskas did Shave or Dye to raise funds for the Irish Cancer Society. He was willing to say goodbye to his ponytail of 15 years in aid of a great cause. Well done Minde! Verde is delighted to announce that it has signed a joint venture agreement with PW Nigeria, one of the largest civil engineering contractors in Nigeria. We believe that this collaboration with PW strongly enhances our offering to provide Infrastructure, Consulting and Project Management services for the restoration of the oil impacted areas in Ogoniland, Nigeria. The redT Energy Storage machines can be coupled alongside renewables such as solar and wind or alongside diesel generators to maximise your energy increase utilisation. They are modular, low maintenance and ideal for use in weak grid or off-grid locations. 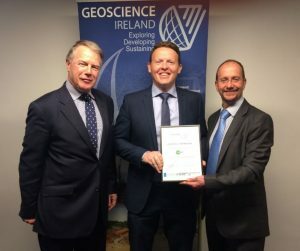 Verde Environmental Group was delighted to be presented with a Certificate of Membership from Geoscience Ireland recently. 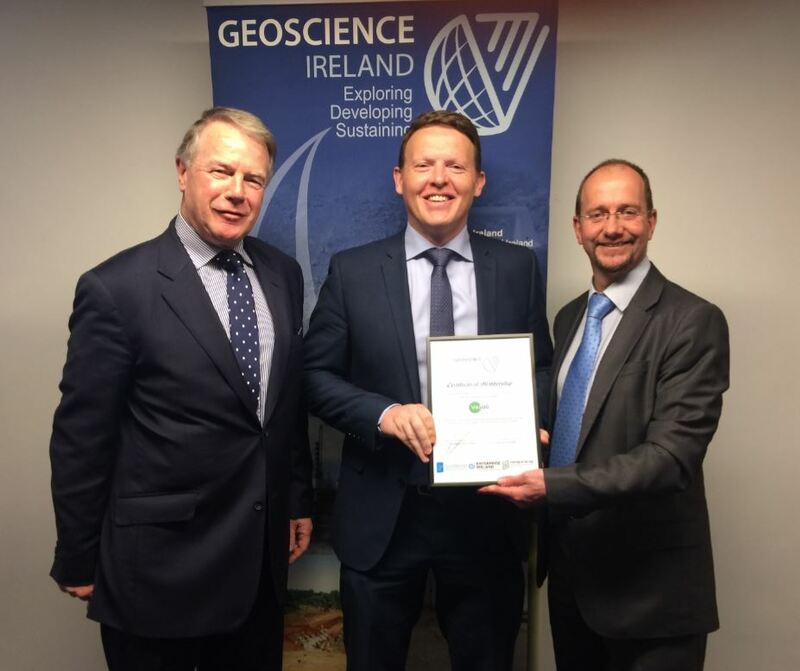 Geoscience Ireland is a network of 31 companies, delivering integrated expertise in water, minerals, environmental and infrastructure development to clients in over 50 countries. Verde Environmental Group form part of the network which provides design, consultancy and contracting services to multilateral agencies, governments and the private sector. Verde has launched the versatile Double Tube Boom System in Ireland. The Double Tube Boom is a highly effective, multi-functional first response booming system. This unique, lightweight boom can be used on land and on water for a variety of purposes, making it the ideal first responder tool. “The Double Tube Boom offers so much to many different industries and is ideally suited as a rapid response tool for local authorities and emergency services of all kinds” says Owen Van den Bergh, Operations Director with Verde Remediation Services. “We are delighted to have taken on the product for Ireland and have also invested in the product for our own site crews, as it provides many options for us in our day-to-day work”. Read more about the Double Tube Boom system here. It was recently announced that Canadian company Alimentation Couche-Tard has acquired one of Verde’s key clients, Topaz Energy. Topaz Energy is a leading fuel distributor in Ireland with over 330 locations. Verde provide environmental consultancy and remediation services to Topaz in all locations around Ireland. 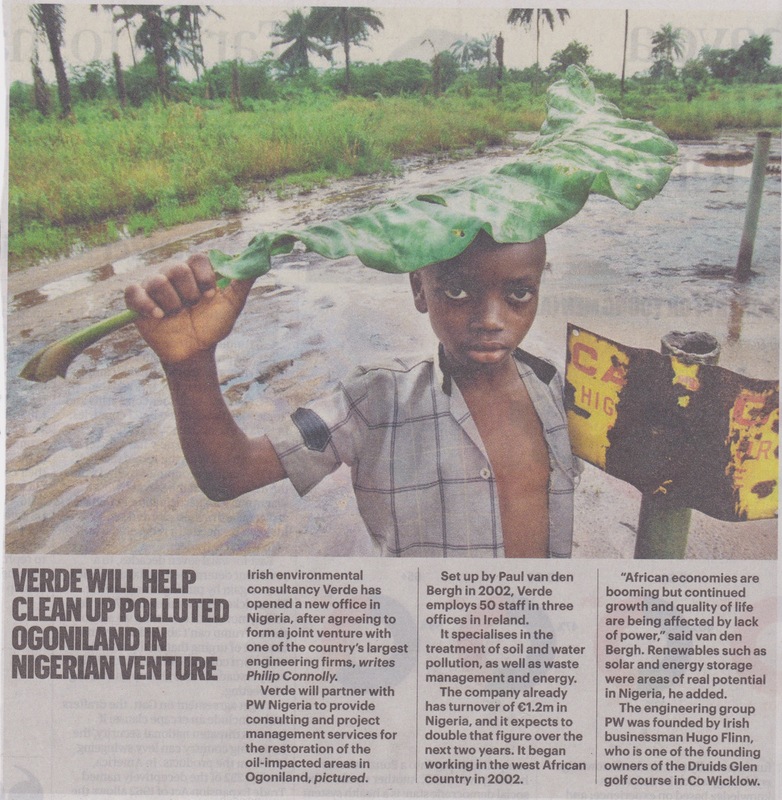 Verde attended the Irish trade mission to Nigeria, which was held in Lagos. 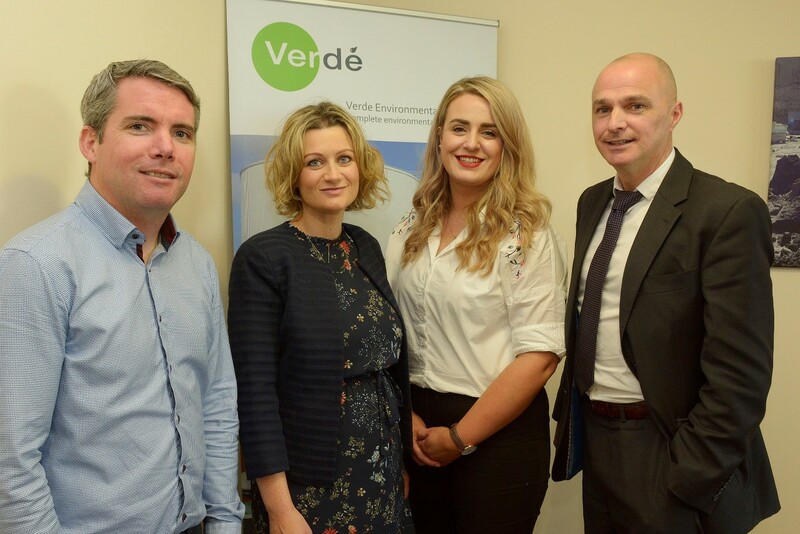 Paul Van den Bergh, Managing Director of Verde Environmental Group, attended the trade event and met with various dignitaries, including Minister for Agriculture and Defence Simon Conveney TD. Verde Remediation Services successfully completed a remediation programme at a residential property in Co. Limerick. The property was affected by a release of home heating oil from the boiler, which caused a significant impact to the building. The remediation programme involved the removal of contaminated materials from the property as well as an in-situ treatment programme to treat residual contamination. Validation that works had been successful was confirmed through soil sampling and analysis and air quality testing. The areas were then reinstated to the satisfaction of the property owner. Verde Remediation Services completed a number of CPD training seminars to insurance professionals in September and October. The training events took place at client premises across Ireland. Further training events for the Institute of Insurance Professionals are scheduled to take place in early 2016. More details can be seen on our Events page. Verde Environmental Consultants (VEC) provided a CPD (5 points) training seminar on EPA Licensing to public sector and private companies at the CMG Professional Training facility in Dublin. The 1 day seminar was presented by Kevin Cleary (Operations Director of VEC) and Cyril Tynan (Principal Environmental Consultant at VEC) and focused on all aspects of EPA license requirements, application and management. The seminar was attended by the ESB, Commission for Energy Regulation, as well as a range of Solicitors, Engineers and Environmental Consultants. The course provides key information regarding EPA Licencing, with an overview of the relevant legislation, as well as going through the stages of licence application, management review and amendments. The course examines a number of compliance assessments that need to be covered, and covers a number of key issues such as dealing with objections, liaising with the EPA, the EPA’s online portal (EDEN), effective licence management, and much more.